I watched “The Puppy Episode” 20 years later. Here’s what happened. I recently discovered that Ellen, Ellen Degeneres’s sitcom which ran on ABC from 1993 to 1998, is on Hulu! It’s funny as I’ve revisited the show how clearly I remember watching the episodes when they first aired – especially the infamous “Puppy Episode” from April 1997, in which Ellen’s character, Ellen Morgan, came out as a lesbian – just as Ellen Degeneres did herself in real life on the cover of TIME magazine. It was, then and now, monumental for so many reasons. It was the first time the lead character in a sitcom came out. There had been gay characters on TV before then, sure, but they were often simply there as plot devices for jokes (Blanche’s brother on The Golden Girls) or for “very special episode” message delivery (the young gay man dying from AIDS on a powerful Designing Women). And let’s not forget Billy Crystal on the groundbreaking Soap, whose openly gay character eventually began a relationship with a woman in an attempt to sort of quell the backlash. 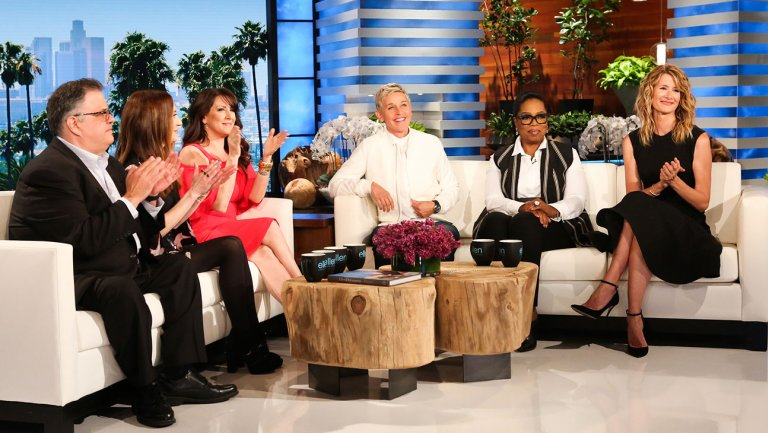 Earlier this year, Ellen devoted an entire episode of her talk show to celebrating the 20th anniversary of “The Puppy Episode,” in which she revisited all the wonderful highs and terrible lows that resulted from it – and even reunited most of the episode’s cast: Joely Fisher, David Anthony Higgins, Clea Lewis, and guests Oprah Winfrey and Laura Dern. It’s worth the time to view the entire episode, which you can do here. The cast of “The Puppy Episode” reunited on The Ellen Degeneres Show April 2017. I was surprised at how emotional I became while watching the anniversary special. Part of my reaction stemmed from being reminded of the negative backlash Ellen suffered in response to her honesty, as well as being reminded of where we were at that time in terms of acceptance and equality. A bigger part of my reaction, however, came from remembering where I was in my own life and with myself at the time. It provided an opportunity to think about how the episode impacted me. I was a junior in high school in April 1997, on the edge of 17, in a very small town in Appalachia. I wasn’t out. And when I say I wasn’t out, I don’t mean to my family or friends. I mean to myself. I was in deep denial. I was pretending I wasn’t gay as I sort of drifted through the days. I was trying to be “normal,” attempting to bury the hurt of the insults that would be hurled my way by people who’d already figured out my secret and to reconcile my inner feelings with the religious beliefs I’d been raised around. I’d come home and pour out my feelings through writing, which became so vital in my ability to cope. (Reading those old pieces now is both heartbreaking and inspiring. Here’s one written at the time this episode aired, as well as a few others.) I’d attempt the classic “pray it away” approach at night and repeat the cycle over again when the sun came up in the morning. That was my life, or at least a segment of it. I watched “The Puppy Episode” with my mom and grandmother that night, not because of the hype surrounding it, but simply because we watched Ellen every week anyway. The episode amazed me. Here was, for the first time, a well-known character (and actor) coming out on national television in front of millions of people (more than 40 million to be exact). As you know, this was pre-Will and Grace, pre-Modern Family, pre-Just About Every Out Celebrity. Okay, that’s unfair. There were plenty of openly gay celebrities, of course, but I don’t think they were necessarily celebrated as such. Just watch the clips of the backlash in the first few minutes of the episode linked above and you’ll understand why. Then, suddenly, Ellen broke down those walls. To my small-town, uncultured, unexposed, deeply closeted teenage self, it was awe-inspiring. If Ellen could do it, why not me, right? Okay, that didn’t happen. But what did happen was, somewhere inside of me, a seed was planted – a seed that suggested maybe, just maybe, what I was feeling was okay. That seed took quite a while to germinate. I didn’t come out (to myself or to my family and friends) for two more years. But I have to hand it to Ellen Degeneres for being one of the first people to really help me begin to look at things differently – to view myself and my feelings not as something to fear or be ashamed of, but to celebrate. So while Ellen faded from view, it’s now accessible in all its glory on Hulu. And, I must say, two decades later “The Puppy Episode” holds up. Inevitably, appreciating how far we’ve come requires acknowledgment of how far we have yet to go. Let us not pretend for an instant that there aren’t still people living the very life I described for myself above. But I’m not going to address that here, instead focusing on the progress. We – and I – have indeed come such a long way in 20 years. While it wasn’t something I necessarily acknowledged at the moment, with distance and perspective I can certainly point to Ellen’s coming-out episode as a touchstone in my process of self-acceptance, at a time when I needed it so desperately. And for that, Ellen Degeneres, I say thank you.